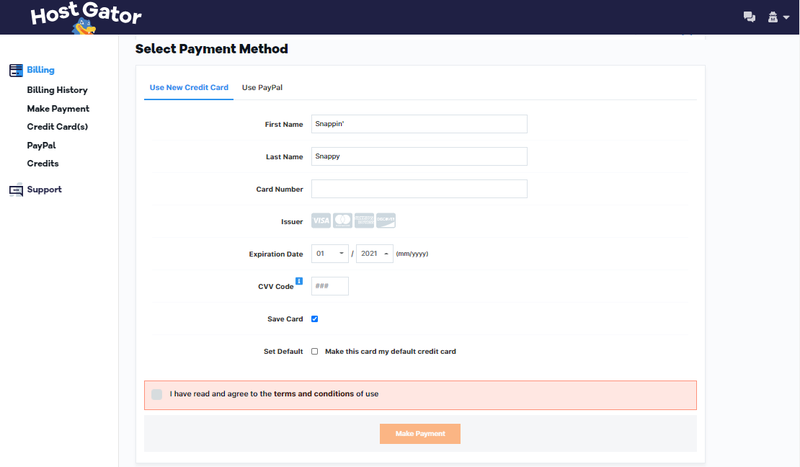 HostGator allows you to either make unscheduled advanced payments on your account, or you may have your billing cycle extended so that your regular automatic billing payments use your preferred billing cycle. New VPS sign-ups can select a recurring billing cycle of up to one year. To change the frequency of payments by changing your billing cycle, please contact our Billing department via phone or Live Chat and tell us how often you want to pay. For the protection of your account, please include your PIN number with your request. You may only make an advanced payment on a hosting package that has its payments up to date. If there are any invoices due for your hosting package then you will need to pay the existing invoice before continuing. 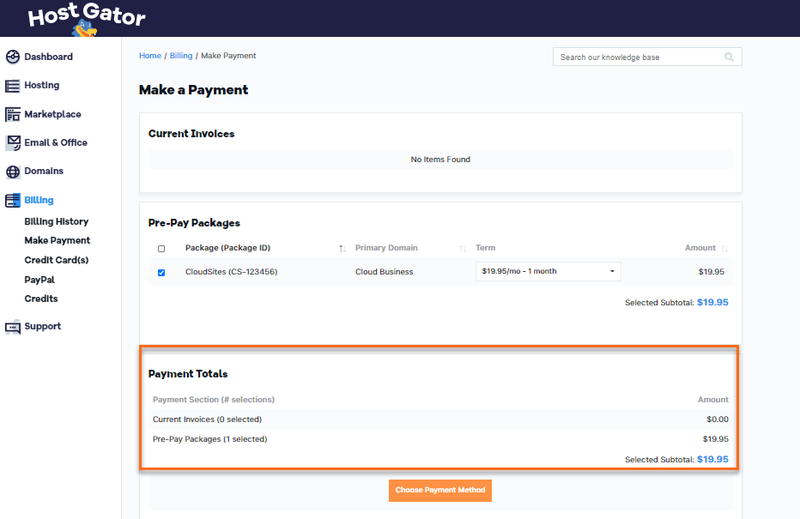 Navigate to the Pre-Pay Packages section under Current Invoices. After confirming that everything is satisfactory, click Choose Payment Method. If you wish to use a new credit card, you can do so by entering in the new credit card details in the tab New Credit Card. To save this card and enable it as the default card on your account, select the box next to the Set Default option, as shown below. If you wish to use the already saved credit card on file, select the tab Use Credit Card on File and then the saved card you wish to use. If you wish to use PayPal, select the tab Use PayPal and select to pick to either setup a Payment Agreenment or make a One-Time Payment. You will be asked for your PayPal information on the next screen. Once the payment method has been selected, click the box to agree to the Terms and Conditions, the box should then turn green and the option to Make a Payment should now be available.